ZillowThe midcentury modern home has 7,000 square feet and has been rented for as much as $90,000 a month. Bing Crosby's Rancho Mirage vacation home -- another place where Marilyn Monroe was rumored to have one-on-ones with President John F. Kennedy -- is on the market for $5 million. The midcentury modern house was built for the crooner in 1958 and boasts 7,000 square feet nestled on 1.4 acres. 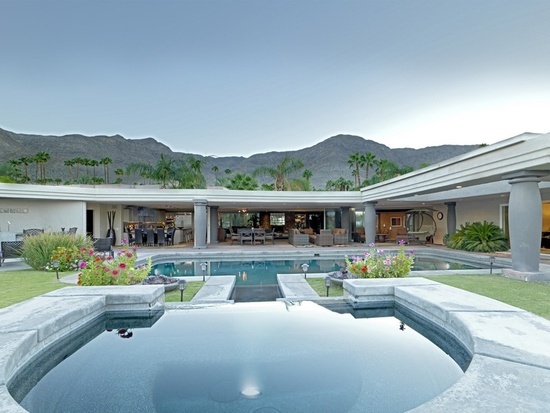 The property overlooks the Coachella Valley and Thunderbird Country Club, where Crosby would play golf with his celebrity pals. Crosby died in 1977, and the house has had a couple of owners since. For the past five years, it's been rented for as much as $90,000 a month. "It's a unique property with these amazing views," said Carl Blea, who is listing the property with Marc Lange of HOM Sotheby's International Realty. The house features huge, hand-carved Moroccan doors -- fitting for Crosby, who starred in 1942's "Road to Morocco" with Bob Hope. Sliding glass doors opening to the pool and outdoor entertainment area. The listing says the home is "steeped in regal celebrity history" including rumored secrets like "the celebrated evening shared by JFK & Marilyn Monroe in 1962 in this home's casita." This is the second house to go on the market recently amid talk the movie star and the handsome president had a little somethin' somethin' in a Southern California pool house. Farralone, a former Frank Sinatra party pad on a Los Angeles hilltop, previously has been marketed as a place where Marilyn and JFK had pool-house trysts, too. It's selling for $7.5 million.